The NextArcade game service from TLC Industries has officially launched. Offering brand new arcade-style games, NextArcade looks to keep the arcade gaming genre stocked with fresh new titles. (Full Press Release) Be sure to check out their game club and their offer of a free control panel with a one-year subscription! I've mentioned this experiment in "augmented reality" before: a human Pac-Man game, with players wearing special gear that superimposes the game elements over the real world. Well, thanks to Keith Corcoran, I now know of some video of the game in progress! Now let's get a Robotron or Sinistar version going: "Run, Coward, Run!" There's a new PC-based Jukebox program available, which looks like it will work well with MAME cabs: the Eliminator V2 by Jukebox Pro software. PR Quote: "This software has been available in Australia for the past year and has taken Australia by storm. Now it's available for the rest of the world." Here's something to read while you digest that turkey dinner: Contributing reviewer James McGovern has just finished his review of Once Upon Atari: The uncensored story of what happened behind the scenes at Atari. It's a DVD documentary of the wild and crazy early days of Atari, when complete creative control was a given and a hot tub in the office was just another perk. The new SlikStik balltop joystick handles are now available. These are very, very cool looking handles, with removable metal balls that are available in both stainless steel and anodized aluminum colors. What's the best part? The price — at $21.99, these new balltops are almost half the price of the old single-piece versions! MAME 0.89 "Turbo Outrun Release"
Littlewing has announced their latest pinball simulation, Monster Fair. The game looks great, has a weird theme (aliens crash on earth and disguise themselves as circus performers to earn money to fix their ship? ), and comes from a company whose products I've enjoyed since Crystal Caliburn years ago. Looking for more reviews of retrogaming-themed games? Be sure and check out this thread over on the BYOAC forums. "NIVO" will be posting new reviews in this thread in the future, making it a great place to get suggestions on what games to check out next. Here's a nice gift for a fellow retrogamer: arcade-themed pewter ornaments for the Christmas tree. As fellow reviewer James McGovern said, "I can hear the thunder of the approaching Namco lawyers," so hurry if you're interested! ArcadeControls.com is having a holiday giveaway, with lots of arcade goodies, ranging from autographed copies of Saint's excellent Project Arcade book (review) all the way up to a complete cocktail cabinet kit from Arcade Depot! Very cool, and it looks like they'll be giving away two gifts a week, so the odds are good. There's another new interview up on the Coin-Op TV site, this time with Anson Sowby, Marketing Director for Jakks Pacific Inc's TV Games. (review). Be sure and check it out! Looks like rapper Chingy is a pinball fan: not only is his latest rap video pinball-themed, his glitzy web site even has a flash-based Chingy-themed pinball simulation! Now, I'm not a big rap fan, but I gotta respect anyone who loves the silver ball, and Chingy sure seems to be a fan! Check it out for some serious pinball/rap synergy. Think Pac-Man is engrossing? How about playing a VR-enhanced game of Pac-Man, where you run around the real world wearing a VR helmet and seeing computer-superimposed dots and power pills? Sound like fun? You know it...now where do I sign up for the beta testing on this thing? Direct from the press release: "Xgaming is pleased to announce it has signed an exclusive distribution agreement with WOW Stuff Limited; Boystuff.co.uk for the sale of X-Arcade products in the United Kingdom." The first review this week (yes, there may be more than one!) is of Treasure Cove's decal sets. Offering both reproduction and original artwork, these decal sets can restore and improve the appearance of your pinball machine. Check out the RetroBlast Review Page for all the details. Well, it looks like SlikStik is expanding their product line again: this time they've opened up a "SlikStik Parts Store" that offers Happ joysticks, trackballs, and other accessories, such as T-molding. The cool thing is the prices: they're less than Happs! Of special note are the custom SlikStik monitor brackets, which can be used to mount an arcade monitor in practically any cab. If you're building a cab, be sure and check it out. I just had to post a note about the excellent service I received at pinball parts supplier Bay Area Amusements. I placed an order late yesterday, and in less than a hour had a shipping notice show up in my email! They've always had what I needed for my pinball machine, always been very fast (although this is a new record!) and they have very good prices as well. If you've got a pinball machine, be sure and check them out! Looking for some good retrogaming video interviews? Robert Welkner, producer of Coin-Op TV, has just added a fourth episode this weekend with Steven Hertz, a premiere collector of all the Laser Disc arcade games. Check it out! SlikStik just posted an interesting sneak peek of their new metal joystick handles, which include swappable balltops that will be available in both stainless steel and new colored anodized aluminum! They look great, and I can't wait to see how they look in a cab. According to the post, they should be available on SlikStik.com within the next two weeks. Now that's a Halloween Display! Here's something intriguing: the EAE Electrics OptiBall Trackball, an industrial optical trackball, complete with a PC-standard PS/2 connector! It's a German company, and I don't know if they have a US distributor, but it's worth a look. Thanks to Angel Moreno for the news! Here's something so innovative it's hideous. It takes the concept of the "FrankenPanel" to a whole new level, adding in dual monitors and...well, words just escape me on this one. Just go have a look. Hot off the keyboard is the written RetroBlast review of the SlikStik Solitaire-J Unit, now available on the RetroBlast Reviews Page. The Solitaire is SlikStik's new single-player unit. It's certainly large, but is it in charge? Check out the review for all the juicy details. Yes, the pinball-oriented version of MAME has been updated from version 1.33 straight up to version 1.50! Why? Because so much has been added and changed! Head on over to PinMAME.com for full details on what's new. Ever wondered what makes tempered glass different from regular glass? Want to know why pinball machines use tempered glass? Well, you're not going to get the answers here, but be sure to check out this video of some "field testing" of some old pinball glass anyway (click on the "Playfield Glass Test" link). See what it takes to break tempered glass, and marvel at the explosive results. Sorry for the lack of news: I got caught up in the election coverage, and spent a good part of yesterday refreshing web pages while channel-surfing through the cable news shows. Needless to say, i didn't get to bed until early this morning, and I'm fried. I'll try and get some "real news" (i.e. retrogaming news) up later this afternoon. After a nap. Steve Lilley-Hopkins (of MAMEWAH fame) emailed me to let me know he's posted a mini-review on BYOAC of his cab's new 49-way joystick. 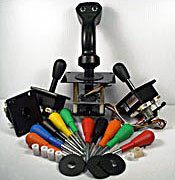 If you've ever considered adding a 49-way joystick to your control panel (or are just curious about what the advantages and disadvantages are), be sure to check out his posting. Thanks, Steve!